Sorry, the Wonder Woman movie actually does come out in February. March is the release date of the Blue Ray Disc and On Demand. Being a pretty big fan of comic books, I am super excited about the latest DC Universe animated movie. 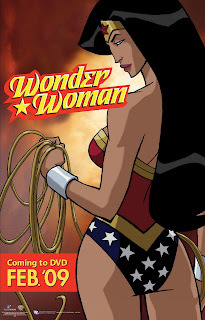 (Personally) I think that it is about time that Wonder Woman is getting a movie (even if it is just an animated one). if you liked Batman: Gotham Knight, Superman Doomsday, and Justice League: The New Frontier, You're sure to love Wonder Woman. To see the trailer, click on the link wonder woman. "On the mystical island of Themyscria, a proud and fierce warrior race of Amazons have raised a daughter of untold beauty, grace and strength – Princess Diana. When an army fighter pilot, Steve Trevor crash-lands on the island, the rebellious and headstrong Diana defies Amazonian law by accompanying Trevor back to civilization. Meanwhile, Ares (the god of War) has escaped his imprisonment at the hands of the Amazonians and has decided to exact his revenge using the mystical “Hand of Rage,” an ancient artifact with the power to raise armies from the dead and infuse them with a thirst for blood. Ares intends to start a world war that will not only last for centuries – but will wipe out every living being on the planet, starting with the Amazons! It is up to Princess Diana to save her people and the world – by using her gifts and becoming the ultimate Wonder Woman!" 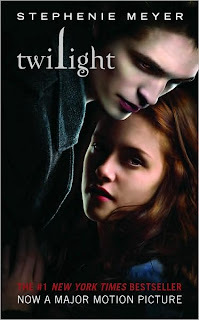 The movie actually doesn't come out till March 3, 2009 (unless they change it again). Wonder Woman can also be found in here on comic book series (which I love). 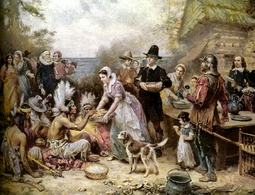 Since tomorrow is Thanksgiving, I will try to make this as short as possible. Being a cooking holiday, Thanksgiving is stressful. With all of the work that goes into making the turkey, pies, rolls, and various other things (depending on your families tradition). Here is what my day is going to look like. 1. My family will drag me out of bed at some disgusting hour (I am so not a morning person) to watch the Macy's Day Parade. 7. Start putting the side dishes together. Oh, how I love the chaos of the holiday season! One of my more embarrassing guilty pleasures happens to be The Princess Diaries series by Meg Cabot (I love Meg's YA books). 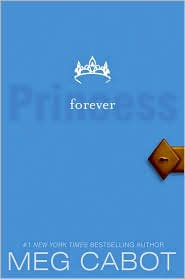 I am so excited about the upcoming release of "Forever Princess" in January (I wish it would be out in time for Christmas), even though Mia makes me so mad sometimes (OK, most of the time), because she is so self obsorbed (I won't say any more, just in case you didn't read "Princess Mia"). And don't even get me started on Lily her (ex) best friend, who (is extremly jealous of Mia) hates that Mia's a princess (she started Ihatemiathermopolis.com, but could there a reason behind Lily's madness?). I wonder, does anyone else (sometimes) prefer sidekick, bestfriend, non main characters, over the star of the book? "The Princess Diaries wraps up in a series finale certain to please the legions of Princess Mia fans. Cabot shows off her singular ability to retread her story lines while leaving audiences breathless to get to the last page: Mia will be certain that this time she's sunk, for real, and oblivious to what is writ large to everyone around her. Here she copes with the pressures of prom (J.P. hasn't asked her), graduation and college acceptances (she's lied through her teeth about them), not to mention her 18th birthday and a party orchestrated by the imposing Grandmère. And why doesn't anyone want to publish her pseudonymous romance novel, Ransom My Heart? (Brief excerpts are tossed in, and absolute devotees can polish off the entire work. When former boyfriend Michael returns from Japan with his revolutionary medical technology a complete success, Mia is where readers love her: insecure and self-deprecating. By now, however, she understands that being royal means "always being the bigger person, and being kind to others"-and she can act accordingly. A character like this deserves the happy ending Cabot virtually guarantees." Reaper, Will You Ever Return? I have a love/hate relationship with this time of year, I love the fact the the holidays are just around the corner (yay), But then on the other hand ALL of my shows are going on break (so very bored). Last week was the last episode of Supernatural for the year, my other favorite show Reaper hasn't even started it's second season (please, say it isn't canceled), so now I am forced to wait till January for more Supernatural, Burn Notice, and Psych, by the way Psych has a Christmas special playing on the 28th of this month (this show is so funny, Shawn and Gus rock). Does anyone know if Reaper will be returning anytime? So for those unfortunate souls who have never seen Reaper, here is a synopsis on the show. "Sam Oliver lives at home with his parents and brother in the Seattle area. He has always wondered why his mom and dad were so easy on him, whether it was sports, school, or career choices, and so hard on his younger brother. Sam dropped out of college ("It made him sleepy", Sock explains) and takes a dead-end job at the Work Bench, a home-repair superstore similar to Home Depot. He spends the rest of his time hanging out, playing video games, and pining for his co-worker, Andi. On Sam's 21st birthday, his parents are behaving very strangely, and Sam himself is seeing hellish visions and experiencing odd events. His father eventually explains that many years ago, he was very sick, and in return for restoring his health, he and his wife promised their firstborn child to the Devil. Although the couple intended to cheat the Devil by having no children, this plan went awry when Satan convinced their doctor to lie and tell the couple that they could not conceive in exchange for wiping his gambling debts clean. Sam is born shortly thereafter. After informing him of his fate, the Devil explains to Sam that he must serve as his bounty hunter (or "Reaper"), tracking down souls that have escaped from Hell and sending them back using his new powers (which have included telekinesis and electrical powers) and vessels, varied objects said to have been hand-made in the bowels of perdition by the iniquitous and the vile. Vessels appear inside a long wooden box sent for Sam to open (with the Italian inscription "Lasciate ogni speranza, voi ch'entrate" ("Abandon hope, all ye who enter here"), as was written on the entrance to Hell in Dante's Inferno, and are specially designed for each job. Examples throughout the series have included a Dirt Devil vacuum cleaner, a Taser gun, and a cigarette lighter. Although Sam initially balks, Satan tells him that should he refuse, then Sam's mother's soul is forfeit. Unwilling to sacrifice his mother, and convinced that he is doing good in the world by tracking down evil souls, Sam accepts his fate. With the help of his slacker friends Sock and Ben, he begins his new life tracking down the corrupted souls trying to escape their own eternal rewards." author(s) and book(s) to read. Hopefully, with your help I can find something new to read. Truly I am not a very picker reader, having read books all the way from Meg Cabot's "The Princess Dairies" to Dan Brown's "Angels and Demons". 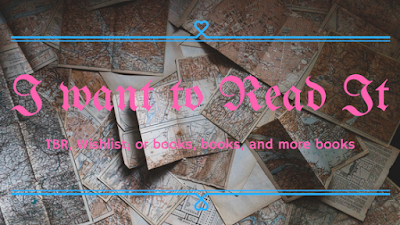 If it's Mysteries, Thrillers, Horror, Fiction, and Sci-Fi. I say, the more ideas the merrier. If anyone has any (and I mean any) ideas, just let me know. I will check out all suggestions. Though I do have one rule, NO romance novels please. 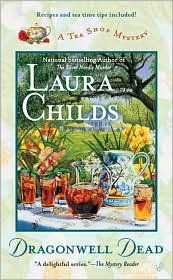 "Each spring, Charleston's upper crust opens their sprawling gardens to the public for the Spring Plantation Ramble, an occasion for flower shows, rare-plant auctions, and contagious spring fever. Although Theodosia Browning barely knows a Phalaenopis from a bog rose, she still enjoys the Ramble, especially since she can promote her Indigo Tea Shop and her latest concoction, Dragonwell Sweet Tea. But the festivities come to a screeching halt when commodities broker Mark Congdon wins a bid for a rare-monkey-face orchid-and promptly dies. It looks like a simple heart attack, but both Theo and his widow suspect that someone purposely turned his green thumb blue..."
Today's challenge will be name that song. I will give you some of the lyrics (it would be to easy if I gave you all of the lyrics) from a song. Your job is to name either the song title or the artist. Without further ramblings on my part, here is your first (and only) clue. My current goal is....to finish all of the video games that I own. One of the X-box games I am (still) stuck in is HALO 2, I'm so lost I don't even know where I am in this game. If anyone can give me some tips I would really, really appreciate it. I borrowed (OK, more like "adopted") this game from my Dad, who never really gave it a chance. HALO 2, the current bane of my existence. 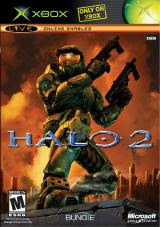 "Halo 2 takes place in the same science fiction universe as Halo. According to the story, humans have colonized numerous worlds due to the development of faster-than-light travel. Twenty-seven years before the beginning of Halo 2, the outer colony world of Harvest was destroyed by a collection of alien races, called the Covenant. Since then, the humans and the Covenant have been locked in a bloody war, with the UNSC forces continually losing major engagements. The Cole Protocol was created in the hope of preventing the Covenant from discovering human population centers, particularly Earth itself. However, shortly before the events of Halo 2, the Master Chief heads to Earth after destroying a Covenant fleet to ward off an impending Covenant attack on humanity's home planet." Again, if anyone can help me with this game (I mean win this game,) that would be awesome. After having picked up "Hacking Harvard" on a whim, and loving it so much that I have re-read it too many times to keep track of, I decided to read the write up for Robin Wasserman's new book "Skinned". It has quickly jumped to being on my Top Ten Most Wanted Books List (as in books I would like to read.) "Skinned"also happens to be the first book in the series. 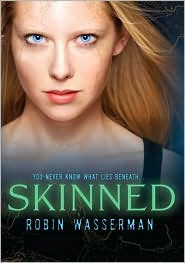 Fans of Scott Westerfeld's "Uglies" and Meg Cabot's "Airhead" should enjoy reading Robin Wasserman's "Skinned". "Lia Kahn was perfect: rich, beautiful, popular -- until the accident that nearly killed her. Now she has been downloaded into a new body that only looks human. Lia will never feel pain again, she will never age, and she can't ever truly die. But she is also rejected by her friends, betrayed by her boyfriend, and alienated from her old life. I love books where the main characters world is turned upside down. I would like to dedicate this post to those who either didn't like the "Twilight" series, or have never read (and don't plan) on reading it. 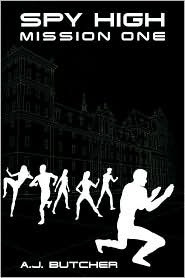 While this book is not vampire (because it's about zombies)related "Generation Dead" by Daniel Water, is definitely worth reading. Final score Harry Potter 75% Twilight 25%. What most people don't know, is that the highly addictive "Rogue Angel" series is authored by numerous writers (I hope this snippet does not ruin it for anyone). Alex Archer is the house name used by Harlequin's Gold Eagle division. "Rogue Angel" was created by Randall Toy, an executive of Harlequin. After falling in love with the history of Joan of Arc, he decided to create a modern day Joan of Arc. The first eight books in the series are written by Victor Milan, and Mel Odom. After the ninth book, new writers have joined their predecessors to work on this series. Each of the books follows Annja Creed, Archaeologist, TV personality, and most importantly current wielder of Joan of arcs sword. Annja Creed's adventures never fail to entertain as she traverses the world, looking for ancient relics, myths, legends. Oh yeah, and saving the world. So far there are fourteen books (with plenty more in the works) in the series. With "Swordsman's Legacy" now available at your locale bookseller. "Polar Quest" out January 13, 2009, and "Eternal Journey" March 10, 2009. I am a huge music fan (who in my families opinion) listens to the radio way too much. But I really can't help it. Everyone says, "Orchid, turn your music down." But I do try to give every new artist, band, ect... a chance. *stop looking at me like that * The truth of the matter is, I don't like DIVA's, and I can only stand a few of those sickeningly, sappy love songs, or worse yet (I hate these the most) those I didn't get what I want, poor me songs! Terribly sorry for that mild rant, back to music. While I am sure that by now, you have probably heard (if you haven't, you have probably been living under a rock)of Lady Antebellum. Their first single "Love Don't Live Here" was awesome, their follow up single "Looking For A Good Time" was just as good (if not better). As one of the newest groups to hit the radio, their CD is definitely worth buying. If your looking for new music, I suggest giving Lady A a chance. Another great song to check out is The Zac Brown Band's "Chicken fried". For those who liked the song "When It Rains" by The Eli Young Band, I highly recommend sampling the CD on Itunes before you purchase it. I was going to ask for it.... Until I sampled it and realized I only liked the one song. As most country music fans know, this upcoming Wednesday is the 42nd annual CMA awards show. I personally have my favorites who I hope will dominate the show, and those who I hope (as bad as it sounds) go home empty handed. Without further ado, I give you this year's list of nominees. "Don't Blink" by Kenny Chesney. "Good Time" by Alan Jackson. "Waiting on a Woman" by Brad Paisley. "You're Gonna Miss This" by Trace Adkins. "Another Try" Josh Turner featuring Trisha Yearwood. "Every Other Weekend" Reba McEntire and Kenny Chesney. "Gone, Gone, Gone" Alison Krauss and Robert Plant. "Life in a Northern Town" Sugarland, Little Big Town, and Jake Owen. "Shiftwork" Kenny Chesney, and George Strait. "I Saw God Today" Rodney Clawson, Monty Criswell, and Wade Kirby. "Letter to Me" Brad Paisley. "You're Gonna Miss This" Ashley Gorley, and Lee Thomas Miller. (Disclaimer) All opinions are those of writer Dame Orchid, you are free (not) to root for whomsoever you choose. Next time, I'll put something a little more recognizable(maybe, maybe not). And the answer for "Human blood is no cement for the temple of liberty." (Drum roll, please) is Daniel O'Connell. I'd like to thank Lady Dahlia, who guessed the answer. Yay Dahlia, congratulations on your victory. Dame Orchid 0, readers 1. Okay, time for a little bit of trivia. The only thing you need to do is be the first to answer the question of who authored the following quote. "Human blood is no cement for the temple of liberty." P.S. I filled in a couple of letters, I hope it helps. Last time I was at the store, I bought a newish/old movie, it originally came out in 2006. While it might be an acquired taste, "Ultraviolet" is none the less a movie that should at least be given a chance. "Milla Jovovich, stars in this story of a woman caught in a futuristic civil war between the government and a subculture of disease-modified humans in whom speed, strength, and intelligence are magnified. 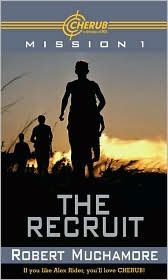 To protect a young boy who has been marked for death, she must fend off the human government." Books I Will Most Likely NEVER Get to Finish! a) The rest of the series is no longer in print. b) That the author never finished writing the series. c) The series was dropped by it's publisher, and not picked up by another. Either way with B) and C) you will never find out how it ends. On the other hand, you don't necessarily have to have a new copy of the book, used books are just as nice. The last series on my list is"CHERUB" by Robert Muchamore. Yes, it's another spy series,*I swear, that I'm pretty sure, I mentioned how much I love spy books*. "CHERUB" follows James Adams. "CHERUB agents are all seventeen and under. They wear skate tees and hemp, and look like regular kids. But their not. They are trained professionals who are sent out on missions to spy on international drug dealers. CHERUB agents hack into computers, bug entire houses, and download crucial documents. It is a highly dangerous job. For their safety, These agents DO NOT EXIST." Yesterday I covered the "Ravenscliff" series. Today, we'll hear about "Spy High" written by A.J. Butcher. Which happens to be one of the best spy books I have ever read! "Spy high" has two different series. The first of which follows Eddie, Ben, Cally, Lori, Jake, and Jennifer, the newest students to be called Bond team. Each of the four teams is named after fictional spy's like James Bond, Napoleon Solo, Richard Hannay, and Harry Palmer. They will have to overcome their differences to make it to graduation. The first series consists of "Mission One", Chaos Rising", "The Serpent Scenario", "Paranoia Plot", "Blood Relations", and "The Annihilation Agenda". "This year's Bond Team at Deveraux Academy is an unorthodox group—from Cally, a skilled computer hacker living on the streets, to Jake, the only student ever to have come from the agri-domes of the Midwest. At first, in-fighting and incompetence push Bond Team to within a hair's breadth of expulsion. But when the team is sent on a wilderness survival trip, they uncover a secret lab run by a maniac with the power and resources to threaten world security. Suddenly, expulsion is the least of Bond Team's worries"
The sixth book in the first series was Never published in the United States, neither was the second series. Series That I Will Most Likely NEVER Get to Finish!!! Over the past few years I came across three series that I might never get a chance to finish reading. Two of the series are by British authors, the third author is possibly American. I think I'll start with Geoffrey Huntington's (not his real name)"Ravenscliff" series, it follows young Devon March. "Is this the destiny he had come to find? To die in a house of secrets, to discover not his past but his fate: doomed to spend eternity as one more ghost haunting the halls of Ravenscliff?" After the mysterious death of his father, Devon is sent to live with a friend of the family at the dreary seaside house of Ravenscliff. Shortly after his arrival to Misery Point, he learns that he is part of a three-thousand year-old tradition of magic and mysticism, a sorcerer of the Order of the Nightwing. Can he survive the mysteries that are deeply rooted at Ravenscliff long enough to stop a madman? Will Devon be able to decide who he can trust? Ravenscliff was published by Reagan Books which WAS an imprint of Harper Collins, sadly RB went under, the third book "Blood Moon" was completed, but it never made it to publication. I guess I'll never know how it ends *Gives a long dramatic sigh*. I know, I've been dragging this out for awhile, but it's finally time to find out what is currently my absolutely, positively favorite Agatha Christie book, character(s). So I have recently read one of the Tommy & Tuppence Novels, and I have to say that they cracked me up. Tommy is offered a potentially dangerous top secret job, while Tuppence who refuses to be left out of anything, decides to get involved, chaos ensues. This suspenseful tale, takes place during WWII. Where it finds the Beresford's now matured, but still doing what they do best... having adventures. As this unlikely spy duo help to defend their country by routing out two highly placed Fifth Columnist. After being asked by the British Intelligence Service to go and stay at the Sans Souci guest house. 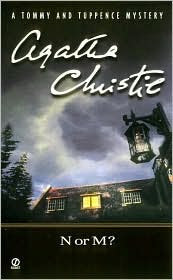 Tommy shocked to see Tuppence there, leads them to team up to find out which of the guests is N or M.
To find out more about Agatha Christie visit the following link.